Tiffany was born in San Diego, California but the life of an Army “brat” brought her to Fayetteville NC when she was three. Tiffany grew up in Fayetteville, and upon graduation from high school, she joined the Army, completed Airborne School and was stationed at Ft. Bragg NC. An Iraqi Freedom War vet, Tiffany pursued her education after leaving the Army and she earned a degree in Paralegal studies in 2013. 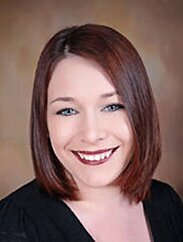 The mother of two sons, Tiffany has been with Residential Mortgage Corp. since 2013.